November marks a time in my life where I stop and appreciate everything in my life that I am a thankful for. I have an amazing life for which I am grateful. In the hustle and bustle of life I sometimes forget how lucky I am. November is also the time that I try to teach some of these life lessons to my young children. If I could only teach my children one thing it would to be kind and caring. This day and age a little kindness can go a long way. Raising children to be appreciative of what they have and to be courteous to those around them needs to begin very early in childhood. Teaching Toddlers Thankfulness can be so simple, it is all about modeling behaviors and having meaningful conversations. 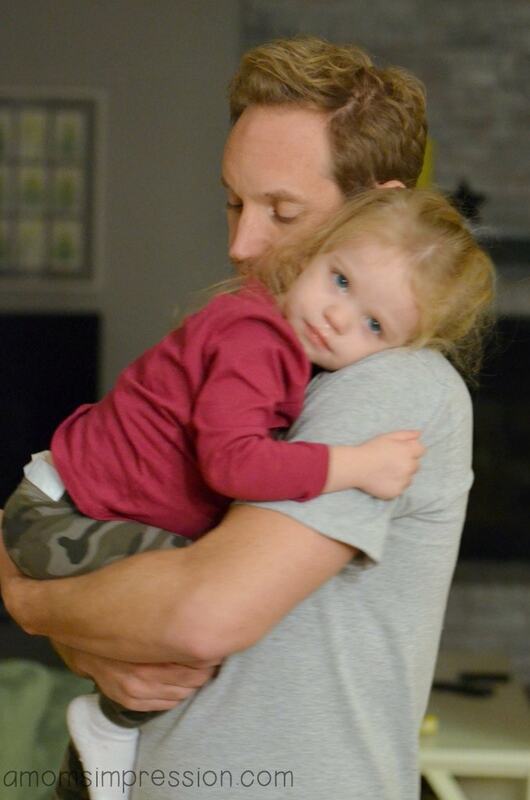 Teaching our daughter how to be thankful for what is important begins with modeling. In my classroom I have a teaching method that is very affective. First, I teach a short mini lesson with one teaching point that I want my students to learn. In my mini lesson I choose I quick concept, I model it, and then finally they go off and practice it on their own. Small children need these short little mini lessons in order to stay engaged and practice the skill that you are trying to teach them. Practice makes perfect is what they say! When introducing the concept of being thankful with my kids, I use this same method; teach, model and practice. 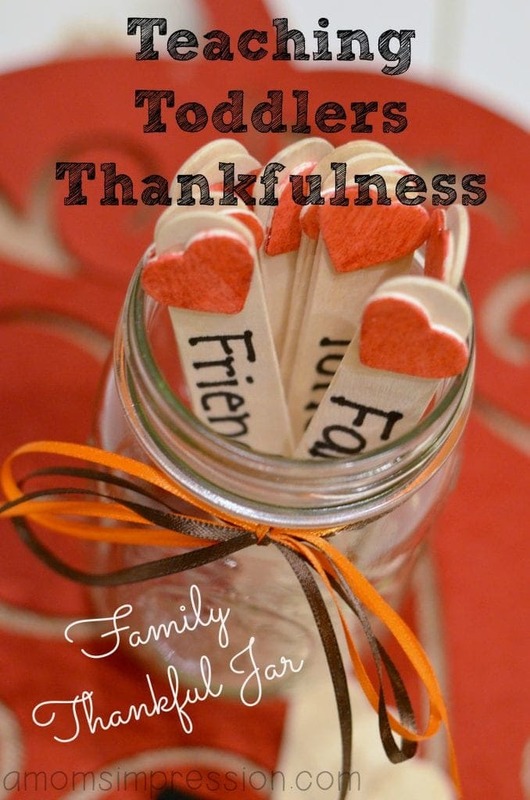 Making a Thankful Jar is simple yet effective. Kids need to have a visual representation of what they are learning. Learning to be thankful can be abstract and I knew I needed a model to help with the process so I created our Family Thankful Jar. It was very simple to do and the kids loved helping me. First, I found an empty Mason jar and tied some festive ribbon around the top. 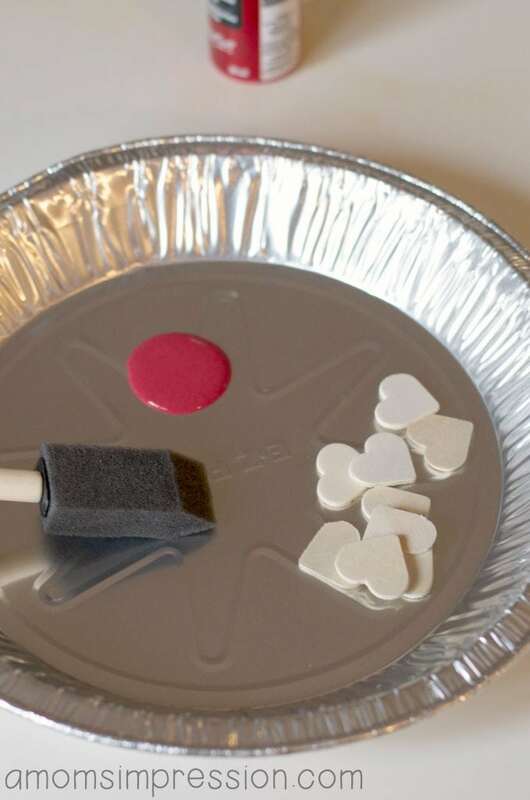 Then we painted some hearts with some leftover glitter paint we had from a previous project. Finally we glued the hearts onto some craft sticks and we were ready to start thinking about what we are thankful for. At dinnertime we each took one stick and wrote what we were thankful for. As you can see, my two year old was thankful for the toilet (hey its really important to her at the moment). The important thing is that we had a family conversation about things that are important to us. My husband and I modeled to our kids why we were thankful for the things that we chose. Next weekend we are planning on repeating the process, we will do it every weekend leading up to Thanksgiving. However your family chooses to acknowledge what they are thankful for this month, be sure to include ways for your toddler to join in. I would love to hear how you teach your children ways to be thankful. Do you have a project you do in November to show what your family is thankful for? That is such a great idea. I love it. It’s simple and easy for the littles to understand. This is such a great idea. It is an easy way to help kids learn. We always cut out paper turkeys and we would each write what we were thankful for. I really like how you’re doing it continuously. That will help them grow grateful hearts! This is such a great and visual way to teach kids to be thankful in their everyday lives. And thankful for the toilet? That’s too cute! I had my kids take pictures of what they are thankful for and one of them took a picture of the toilet. So, that is something that everyone is thankful for, big or small, it seems lol. I love that she is thankful for the toilet. This is a really cute idea. That is great. We do my wish for you in a jar. (write wishes down for someone to have a great game, new job, etc). This is such a sweet idea! 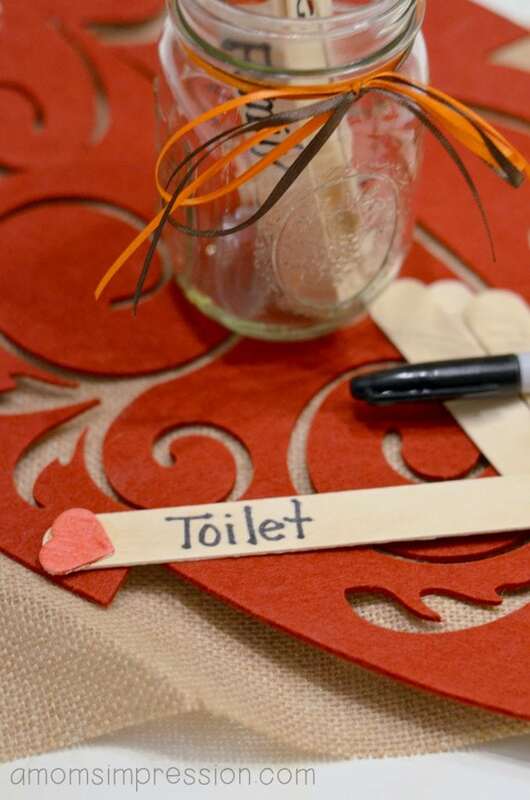 I love that toilet was a thankful item! This is so important! And what a great way to do it! What a cute idea! So perfect for November. We have been talking a lot about Thanksgiving and how/why we should show gratitude. We hadn’t though to do something like your family thankful jar though. Now I need to get to brainstorming! I love this idea! I’m thinking of my family’s project this month. I just LOVE the idea of a toddler thankful jar! What a fun way to celebrate the season. What a great project. Toddlers are such visual learners and this is sure to get them thinking. I love craft projects with the little ones too. Currently we don’t have a Thanksgiving project, but we should. I really like your idea. So many different things to be thankful for this year. This is a great idea and a good way to show kids how to be thankful. This is a really great idea! I love that you made it a mini-lesson so that it will be able to hold a toddler’s attention! This is such a great project to work with kids on teaching them to be thankful for various things or people in their life. I try to teach my kids from day one to be thankful for what they have in life, that many others go without a roof over their head and to be thankful for what we DO have. I love projects like this. This is a perfect craft for the season. My kids are visual, so this tool would definitely help! I love this idea. I love that she chose toilet as her thankfulness. It is important to her at this time so it’s perfect. Great idea to teach children Thankfulness at an early age. Honestly some adults need to be re-reminded of this beyond Novemeber…cute way to present it! Great idea! That’s adorable she came up with toilet. We say what we’re thankful for each day after prayers but a visual component is very neat. I really love this idea! It’s so helpful to put visuals to concepts for small frys! I think it is great that you are instilling great values in your daughter at a young age. Being thankful and showing appreciation are such important character traits. This is a really sweet idea. My son has to make a thankful bag to take to school next week. Maybe we will do this on the weekend to help reinforce his school learning. I really like this idea. Teaching kids to be aware of their blessings is really important.